Black Knight Slot is famous for its medieval theme with a brave knight fighting for the glory of the kingdom. It is designed in gold colors and has pretty attractive animations and sounds. However, you’ll see nothing stunning, except of this nice interface. The slot is rather simple without progressive jackpots, multiplied stakes or so. It’s all about winning combinations and free spins. 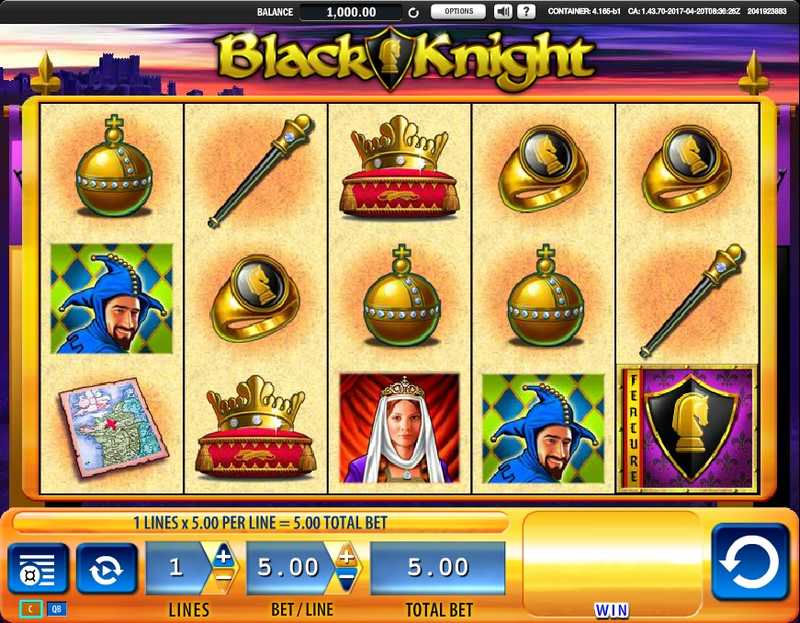 Black Knight Slot was created by Williams Interactive Company. The slot has 5 reels and 30 paylines. As the name suggests, the main theme of the slot is the age of knights. You will meet such symbols like Queen, Crown, Ring and some others. The Wild symbol is represented by the Black Knight wearing his shining armor. The Chess Horse has the role of the Scatter in this game. Not the “Scatter” actually, but the “Feature Icon” as they’ve named it. So, the Wild card. It can appear only on reels 2, 3 and 4. It can turn into any symbol, which is needed to create the winning combination. Now about the so-called Feature symbol. You can get the only bonus in this slot - the Free Spins Bonus - with the help of this symbol. Just collect at least 3 chess horses and you will immediately receive 7 Free Spins. If the Wild card appears on reels 2, 3 or 4 while you are running the Free Spins rounds, it will be expanded on the whole reel and will make it locked till the end of the Free Spins mode. Your winnings depend on the kind of symbols you collect, on the amount of money you bet and on the number of active paylines. The amount of your winnings will be displayed just under the reels. At first sight, Black Knight Slot seems to be very attractive and interesting with its nice graphics and sounds. Honestly, the game’s developers haven’t prepared for you something incredible like huge extra rewards, mini games or something like that. Just a simple slot, which somehow makes you spin the reel again and again. Follow this link to play Black Knight Slot – at least, give it a try.